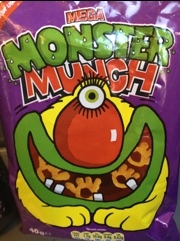 A huge pack of the new old Monster Munch and I’m back at school, packed lunch in tow. Packaging is good, with a couple of those popular hidden jokes and a few references to the changes. The Pickled Onion flavour, which is the only one I’ve tried, tastes authentic and is certainly a decent snack. The big thing is the size of each snack-let. 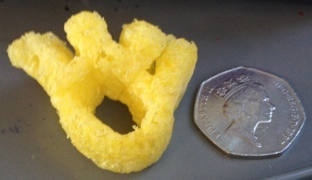 Each foot/hand is well over a centimetre thick and considerably bigger than a 50p piece. Actually, they’re quite hard to shove in your gob! But I’m sure that won’t be a problem to us connoisseurs of snackdom.